Take a big bowl and combine cream cheese, 3/4 cup butter and vanilla; beat well. Add sugar, 1/4 cup milk and 4 squares melted chocolate to the above-made mixture; mix properly. Keep aside 3 -1/2 cup mixture for frosting and let it cool. Now add 2 squares of melted chocolate into the remaining mixture, while stirring. Combine 1/4 cup butter and the eggs with it. Take another bowl and combine flour, soda and salt. Add this flour mixture with chocolate mixture along with 1-1/4 cups of milk. Pour this mixture evenly into 2 greased and floured heart shaped pans and bake at 350 degrees fahrenheit for about 30 to 35 minutes. Allow them to cool for about 10 minutes in pans. Transfer them on wire racks and let them cool properly. Now frost the cake with 3 -1/2 cups mixture and let it cool. 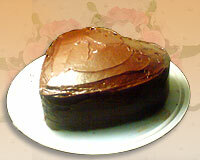 Chocolate Heart Cake is ready.